Narrated slideshows include audio recordings synchronized to images, usually without hand-drawn annotations. 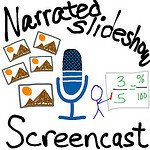 A screencast is a digital recording of a computer screen with audio narration. Screencasts can include telestrator (‘John Madden pen’) annotations. Browser-based: Create an account on the website and use a modern web browser like Google Chrome or FireFox to record, save and share it. Client-based: Download and install software on a computing device to record and save. After recording, narrated slideshows and screencasts can be shared via a website provided by the software publisher and/or via a video sharing site like YouTube or Vimeo. 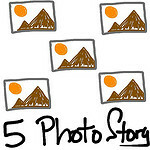 A 5 Photo Story is an excellent project which can be used to build the foundation for a narrated slideshow. Download and install a modern web browser like Google Chrome or FireFox on your laptop or desktop computer. Download and install software to your computer or tablet device for screencast recording. Open your web browser and login to the screencasting site. Directly publish your screencast on the website, optionally cross-post to YouTube. 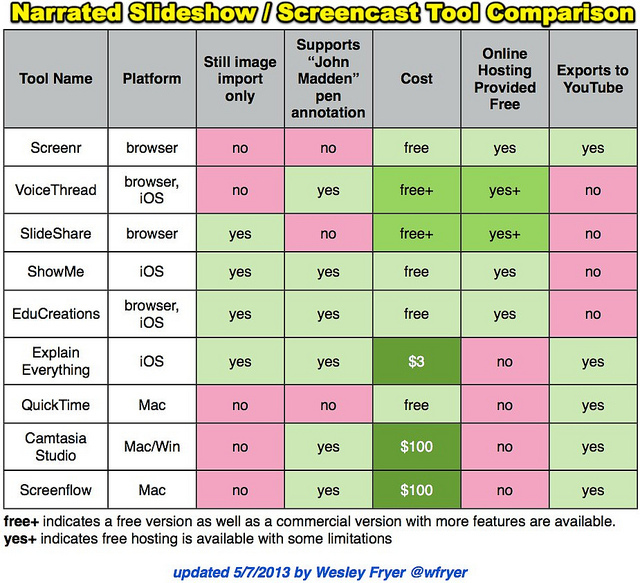 Open your screencasting software program. Save your screencast as a local, editable file. Export your screencast as a finalized, ‘flattened’ (combined) video. 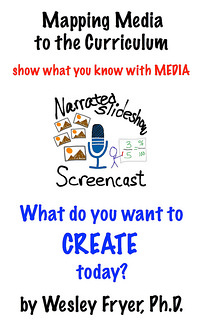 Upload your final screencast video to the publisher’s sharing site or another video sharing site. Khan Academy is the most famous screencasting project currently. The Explain Everything Showcase includes exemplary screencasts in a variety of content areas. I would like to add Knowmia to your list of items compared in the table. It is an iOS app that imports still images, records iPad’s webcam, ability to import video and play it from within the app, and whiteboard annotations are available too. There is no cost for the app as it will be uploaded to the Knowmia.com website for free. Unfortunately, it is limited in download options. Limited to the point of downloading just the recording in Knowmia’s own format. 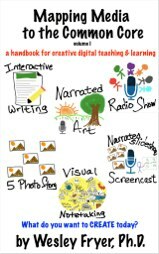 However, I would recommend it over Educreations, Show Me, Screen Chomp, and right behind Explain Everything. Thanks for recommending it Dean – I added it to the list of linked iOS tool options and will check it out!